Our specialised CCTV unit has over 35 years experience locating, assessing and repairing drainage systems. We pride ourselves on providing our customers with the best price, service and advice possible. Once a blocked drain has been cleared, there are a range of treatment and preventative measures available which we can recommend. If your drain is broken or damaged, our Brisbane drain clearing specialists can provide a comprehensive drain assessment with our state of the art CCTV drain camera. Taking into consideration your circumstance and budget, we can offer a range of solutions, from scheduled clearing to pipe-lining. In addition to clearing drains, we also offer a full repair and replacement service for damaged sewerage pipes and junctions. CCTV drain camera inspections are used to determine the condition of sewage or storm water system. 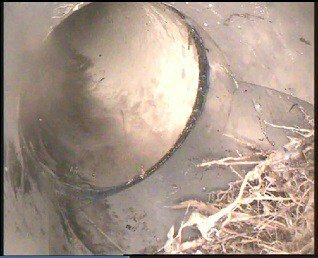 Using a flexible drainage camera, we can assess tree root entry, open pipe joins and squashed/damaged pipework. This is an invaluable tool which allows us to diagnose and locate without the need for excavation. Using state of the art monitoring gear, our drain camera inspections produce high quality images with depth indication. The photograph on the right is a typical example of tree root entry, taken from one of our CCTV drain camera inspections. CCTV drain inspections allow us to locate the position and depth of damaged pipe within a plumbing system. When the camera is inserted in the drain, a locating device held above ground detects its location and allows us to accurately plot out a map of the pipework at the property. This can be especially helpful if a fault within the pipework is found under a paved or concreted area as we can then remove only the necessary pavers/concrete to carry out the repair and therefore minimising mess and reducing the disturbance to the area. All video footage and history is kept on file and is available on request. We generally recommend a CCTV drain camera inspection be undertaken if there are continual blockages in a drain. Once a drain camera inspection has been carried out we can make an informed recommendation for a short, medium or long term solutions. We often find that older style homes are notorious for problematic blocked drains. This is largely due to the earthenware sewerage pipes which are made of clay and joined together with mortar. Over time the mortar crumbles allowing tree roots to enter the line causing a blocked drain. If this problem is left long enough the tree roots are able to rupture the sewer pipes and the sewer line may need to be repaired or replaced. It is in these instances that our highly skilled team of plumbers are able to help. 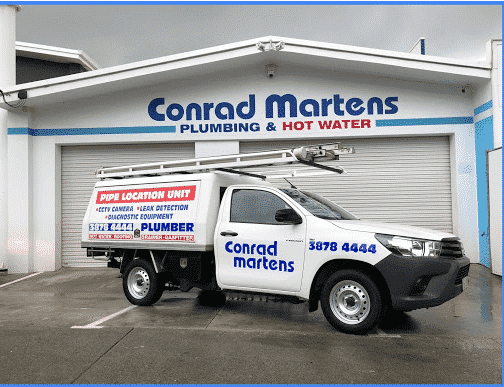 Here at Conrad Martens Plumbing & Hot Water, we specialise in plumbing and drainage inspections. We are experienced in clearing blockages of all shapes and sizes, from minor hair blockages, to severe grease and root intrusions. Our camera systems are state of the art and operated by specialised drainage technicians. Contact us today for a fast, comprehensive drain inspections backed up with a workmanship guarantee. Conrad Martens Plumbing Service has a wealth of experience in emergency maintenance plumbing and drain cleaning. We are strategically positioned to offer same day plumbing and drainage work across Brisbane and surrounding areas. If you would like to speak with a licensed trades person for advice on your blocked drain, do not hesitate to contact us on 3878 4444.